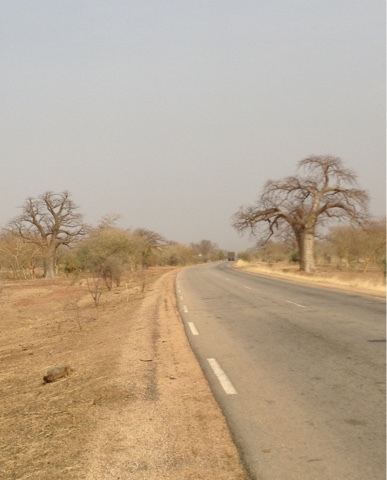 And the baobabs keep coming into Mali, a pair even flanking the road not too far from the border as if providing an official welcome. But like the customs office, there was nothing on them identifying them as anything official. I ducked into four different official-looking offices along a two-mile stretch after I crossed into Mali before I found the right one, even going past it without being halted. Just across the Falémé River dividing Senegal and Mali would have seemed the obvious place to have my passport stamped, but the uniformed officials in that office didn't provide such a service. Kidira on the Senegal side and Diboli on the Mali side are sister cities that citizens can pass freely between, with no need of a passport check. They informed me a police checkpoint three or four kilometers down the road would process me. I turned into a Douna/Customs office, but it was for people transporting goods. A little ways down the road trucks were lined up in both directions. I followed the cars and motorcyclists bypassing them on a dirt road that flanked the main road that they blocked. At last, a mile further I came to an arch over the road with offices to one side and another set in the middle of the road like a toll both. And that is what it was, a toll both. I had missed passport control. It was back where all the trucks were backed up. I only recognized it when I returned by a uniformed guy sitting on the porch in front of it, as there were no signs whatsoever. I was a little nervous about being let in, not because I was so grubby, caked with red dirt thrown up along the road that had deteriorated badly the last one hundred miles, but because my three-month visa had a start date of February 3, when I estimated I'd reach the border. I had made good time, and it wasn't as far as I thought, so I was three days early. It was early in the afternoon. I had contemplated finding a hotel and make my attempt the next morning on the first of February, hoping the customs official wouldn't look so close at the date. But I hadn't seen a hotel to tempt me in Kidira, nor did Kidira have enough allure to make me search for one, so I took my chances that they'd let me in. Not only was I let in, but I wasn't asked for my Yellow Fever certificate. That didn't make me regret getting it though, as I have several other countries ahead that are said to require it. Just as the final 45 mile stretch of Senegal to the border had been in a sparsely settled region with just a couple of villages of no significance, so were the first 55 miles in Mali to Kayes. 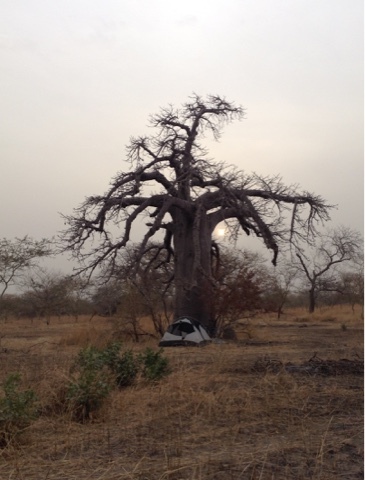 I might not be able to come by food or water, but I knew I would have an optimum campsite my first night in Mali and with a good chance of cozying up to a baobab. I was a little concerned when I suffered my second flat of the trip half an half before dark. It was on the outskirts of a small village, so I couldn't camp there. Luckily, it wasn't a sidewall rupture, as I feared after the last 100 miles in Senegal on a badly pot-holed road. Like the other flat it was from a sliver of wire, fragments of blown truck tires. I made fast work of it and was able to get another three miles down the road, putting me within 29 miles of Kayes, which could be my next opportunity for water. There were baobabs scattered here and there, but the vegetation otherwise wasn't thick enough to camp anywhe near the road. I was able to bike nearly a third of a mile on the hard dirt to a distant baobab with a particularly ornate network of arms. Once again I had a night of rich and strange dreams. The most bizarre found me sharing a hotel room with Stephen Spielberg and Sally Field at a film festival that was short on accommodations. It had only one bed. Spielberg slept in the middle. When he awoke in the morning he lit up a cigarette while still in bed. It couldn't have been at Cannes, because when Spielberg served as the jury president a few years ago, he slept in his private yacht. I didn't have to worry much about exhausting my water supply this night, as I was able to add two half liter bags of water to my reserves shortly before my flat when I stopped at what I hoped was a shop. The shack was actually a police outpost. They gave me the water and waved a hand when I reached into my pocket for some coins. I hadn't been in great need of water as five of my seven bottles were full, but with the ovenish afternoon temperatures I never know how much I'm going to need to drink at night. The temperature generally falls below 70 while I sleep and doesn't start heating up until 10:30, allowing me several hours of luxurious morning cycling. After that, I've got to keep drinking as much as I can. I had no immediate sense comparingo Diboli to Kidira how Mali might differ from Senegal. The food stands weren't any more plentiful, though my first batch of fritters were larger and softer and greaser than any I had had in Senegal. The road surface was an improvement, at least initially. The kilometer posts were spaced five kilometers apart, rather than coming every kilometer. 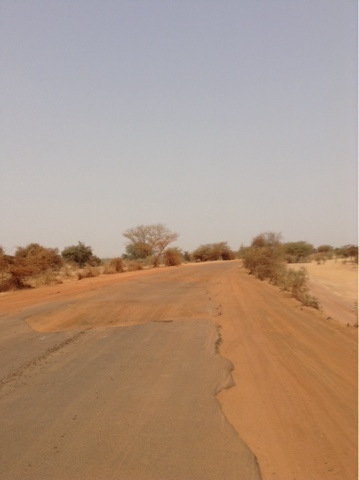 The road had been perfectly fine through most of Senegal. It had been clear sailing the first three hundred miles from Dakar, but after Tambacounda on the lightly-traveled final leg to Mali the road had turned into an obstacle course of potholes and washboard and broken down vehicles. 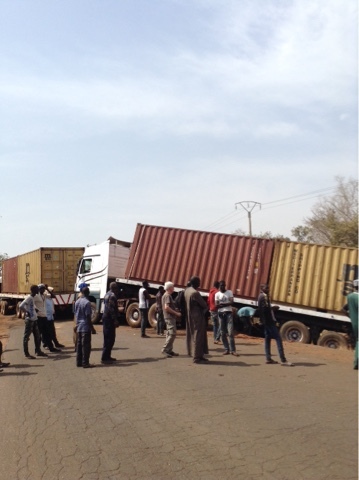 The road was blocked at one point by a huge truck that had gone off the road as another huge truck tried to pull it out. I was able to get around it and had my half of the road to myself for a couple of hours. Amongst those blocked were a trio of French men, businessmen driving a rental car back to Dakar, the first whites I had encountered since Dakar. They knew Africa enough not to be impatient. They asked if I were English. They were delighted to learn I was American, with the one nearest me giving me a hearty pat on the back. 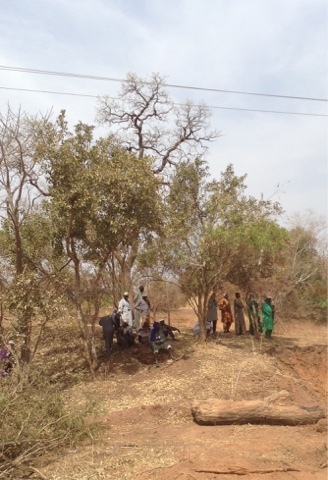 Most of those marooned took shelter under the sparse vegetation. I was generally able to weave around the potholes. In many places where they were prolonged motorists left the road and had created an adjoining dirt byway. As they sped through they stirred up clouds of red dirt. My eyebrows had turned red and my hair was tinged as if I had had a bad dye job. The temperature may be close to ninety, but it is so arid, I'm not caked in sweat, so the dirt didn't have a strong adhesive to cling to as it might have. But my eyes are shedding clots of mud. When I had a chance to wash my shirt, the first four rinsings were solid black. The final meal I loaded into my Tupperware bowl in Senegal was what I had been looking for since I arrived--a bowl of rice with peanut sauce, a dish two of my friends I'll be visiting had told me to be sure to try. There just hadn't been any in the two or three pots at the small restaurants I had come upon until Kidira. It was good enough that if my entry into Mali had been delayed, I wouldn't have minded, so I could go back for more.